May or may not have plastic wrap on item inside. Sold as seen in photos. Trending at $53.65eBay determines this price through a machine learned model of the product's sale prices within the last 90 days. CCC, CE, FCC, RoHS certificated, 24 Months Warranty. Specifications: Model: CAIWEI S6W. Active Shutter 3D Glasses for DLP-Link Projector. Projector Accessories. 4200lms Android 6.0 Bluetooth WIFI Projector. Built in speakers, support audio out. Projector Accessories. 3D Bluetooth Active Shutter Glasses. 3D DLP Smart Projector. Input Ports HDMI 1 / VGA / Composite AV / USB 2 / / Analog TV. Accessories Projector x1. CAIWEI A3 (AB) LCD Home Theater Projector, built-in Android/Wifi, the Android system carries 1GB RAM & 8GB ROM storage, you can directly download apps from Google play store. Updated Bluetooth function, can connect with Bluetooth speakers. Support Airplay, Miracast and DLNA protocol. Manufacturer direct sales, quality guaranteed, 10-year professional seller, 2-year warranty, lifetime technology support, more reliable!. And light weight at 0.173kg(0.38lb), yet its projection size upto 100”. 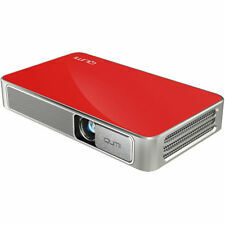 S6 ultra-mini projector with the pico size at 5.5cm(L) x 5.5cm(W) x 5.5(H)(2.17” x 2.17” x 2.17”). 1080P Supported Unique HDMI Connector Design. With insert slides, it is an interesting handy projector flashlight; without slides, it is a bright flashlight like a torch. Easy for daily life, fits for both children and adults. The torch design with tripod holder, the projector flashlight can stand on desk or floor, or be held in hand and carry out. 854 x 480 WVGA resolution. DLP image technology. Usable in places with no access to power outlet. Sorry, No Exceptions. 100 minutes battery life. Makes it easy to connect to high-definition sources. It has multiple inputs/outputs including digital Toslink audio, LAN, RCA, dual HDMI outputs, USB 2.0, USB 3.0, and Aux (headphone jack). It has a microSD card slot to load videos or APKs. It has both WIFI and bluetooth allowing for both external bluetooth sound as well as keyboards and remotes. We will work with you to resolve any issues. new open box item. 3000 Lumen 4K WiFi 1080P Full HD Home Theater Multimedia LED Projector HDMI USB! (Few projectors can do that). Built-in battery makes it to be used freely without having to search for electric plug. ♥ Tiny design, But high performance: Contrast Up to 5000:1, show more vivid colors and darker blacks. Brookstone HDMI Pocket Projector Micro 801143 Slightly used. Condition is Used. Shipped with USPS Priority Mail. This projector is a Miroir M300A housed inside a Brookstone body. Despite the packaging stating 200 lumems, this is a 400-lumen unit. Item was tested, performed flawlessly, and put back in the box. Plastic film was never removed. I unfortunately lost the manual but it can be found online. Bring your favorite movies, presentations, video games, and pictures to the big screen thanks to the world’s smallest DLP Mini Projector by Magnasonic. This high performance pocket projector allows you to connect your laptop, smartphone, tablet, and more. Use your HDMI connection to enjoy a home theater experience anywhere due to the long-lasting 2 hour rechargeable battery and built-in speaker. Vibrant Display Quality In Your Hand Enjoy surprisingly large crystal clear picture up to 60" in size thanks to the 25 ANSI lumen LED light engine powered by Texas Instruments. Sony MP-CL1A Small Portable HD 1920x720 Mobile Laser Screen Beam Projector. Condition is Used. Shipped with USPS Priority Mail. 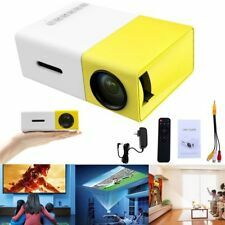 YG300 1080P Home Theater Cinema USB HDMI AV SD Mini Portable HD LED Projector. Condition is Used. Shipped with USPS Priority Mail. NO LONGER USE SO IM SELLING IT, it works pretty good, suggests buying a screen to view it on, but a flat white wall works as well. UO Smart Beam Laser Projector Wireless Portable Miracast Compact - CES Awarded!